With March Madness going on, I thought it would be an appropriate time to do basketball nails. I actually don't care for the NCAA but I do really love the NBA (Phoenix Suns!) so I thought this would be a fun manicure to do. I started out by trying some color combinations on a nail wheel. 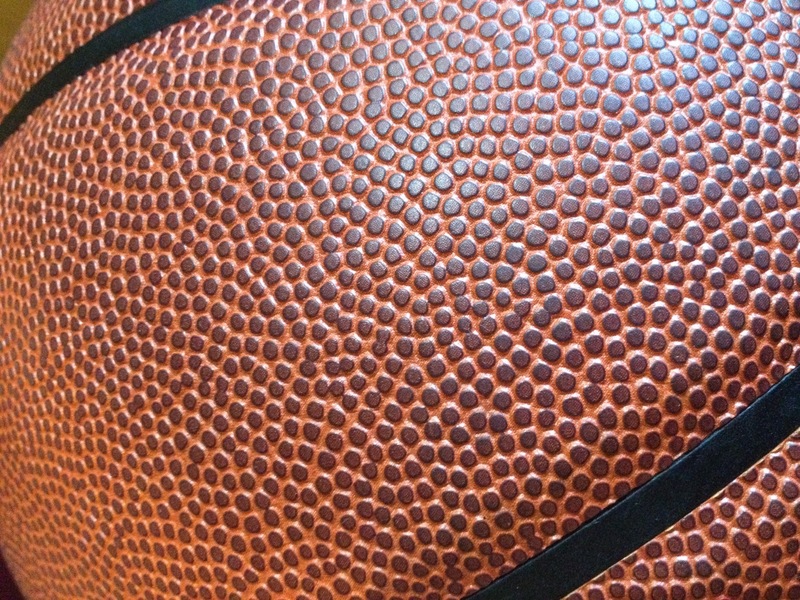 I originally started with an orange base but that didn't look realistic at all... and I really wanted the skin of the basketball to look realistic. So, using a picture I took on my phone as a guide (see the end of the post), I started trying to match colors. I ended up finding a nice base in OPI's Gouda Gouda Two Shoes, which was surprising as I always saw that color as sort of a dusty brown pink. I then added on the dots in China Glaze Brownstone with the small end of a dotting tool. 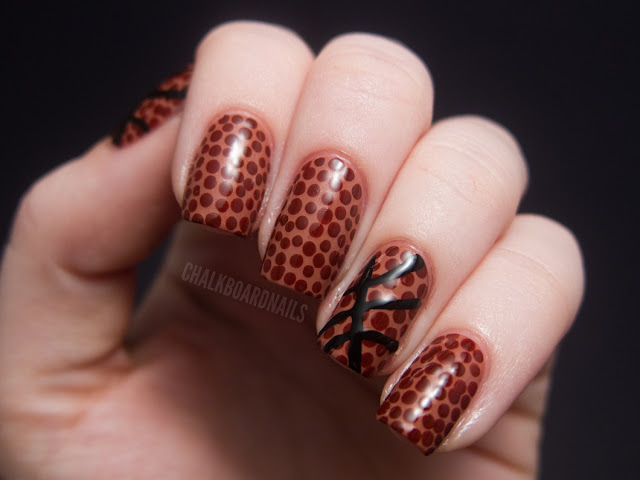 I tried to make the accent nails look like the "seams" on a basketball, though scale wise I know they aren't totally consistent with the dots on the basketball skin. Artistic license, right? :) For the seams, I just freehanded them on with a small nail art brush in Konad black. So that's that! I hope you like it, I was pretty pleased with the outcome of this simple nail art! I also want to mention that every afternoon this week I will be showing a polish from the new GlitterDaze Simply Spring line. Keep your eyes open for those, especially if you like glitter! Love it! I'm not a huge basketball fan, but these are great! Love it! You have some seriously creative manis! I never know what you're going to post, but I always love it! So many dots! That looks amazing. I applaud your patience. This looks really cool 8D! I thought it was a giraffe at first _O_. Those are insane! Those colors ended up being perfect for this, I love them. 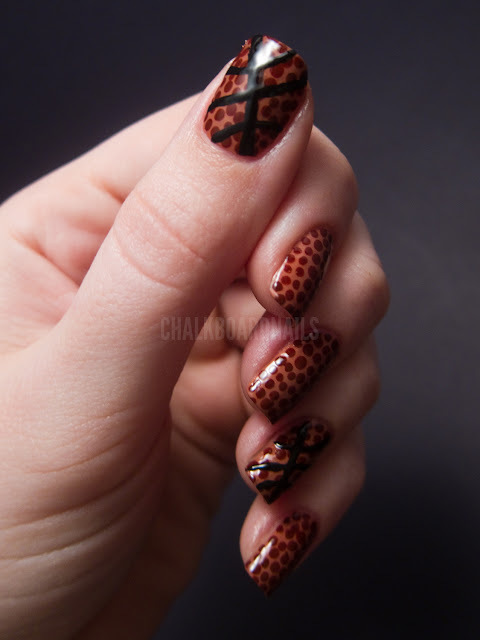 not a basket ball fan, but your nail are amazing! These turned out fabulous! =] I might have to try this for my school's last game. i hate basketball, but this, this i love. it's pretty awesome. basketball is not my favorite sport.. but the result of this is pretty cute!